Cut chicken into small pieces. Batter - whisk egg white and add remaining batter ingredients. Make sure not lumpy or too runny. Add chicken and refrigerate for 1 hour. Heat up wok. Use oil and fry coated chicken pieces until brown. Drain on paper towel. Heat up pan with some oil and cook garlic. Add sauce mixture add corn powder to thicken adjust salt/ sugar to taste. my son’s fave, maybe I can get him to make it! Honey chicken is a lovely meal with fried rice. Will be trying this version. 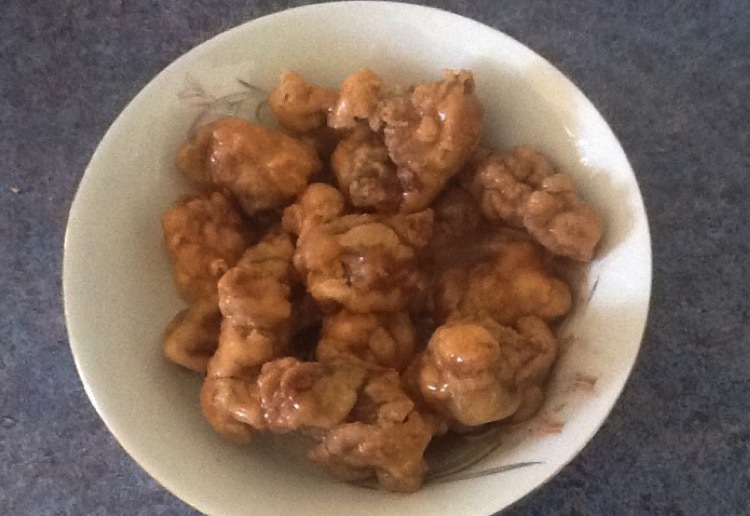 I love honey chicken – just yum. Lovely recipe – thanks for sharing. I had this for dinner, last night..but from the Chinese restaurant..my favourite! Keen to try making it myself! I’ve got all the ingredients in my cupboard I love honey chicken, thanks for sharing will try this one. Im obsessed with these when we go to chinese buffets, but have never thought to make them myself…this could be dangerous. lol. Looks just like in the Chinese shop – thanks for sharing, didn’t realise it was so easy to make! Wow, this looks just like real chinese! I think my daughter would love it!! !